Customer service is excellent and the product is outstanding, I highly recommend Custom Earth Promos. Awesome company, green is the way to be! Reusable bags are the future of shopping. Custom Earth Promos is the industry leader in this front. If you are a business owner in need of reusable bags this is your company! This website is great and so easy to use, simply this is why I use them for my green products. We use these recyclable bags at our salon and there great, clients really love them! This RB2 bag I did on a rush order and received the bags in the time I needed them. Not to mention the way I wanted them no compromise in style! The customer service was great. The craftsmanship of the bags was outstanding. I will be ordering again soon. I love green companies, and it was a pleasure to work with CEP on my recyclable bag project! My local grocery store has made it almost mandatory to use recycled reusable bags. I now see the point - they are durable, able to cleaned, and I really feel like I am helping play a part in saving the planet by not throwing out those 1 time use plastic bags every grocery store run. I now am ordering 300 recycled reusable bags from CEP for my son's wedding coming up. I know these bags will be able to be used time and time again and play a role in saving the planet. This bag is our #1 Seller we have re-ordered 5 times now and counting!! With the amazing discount we got on out bulk order, we were able to have great bags for our marketing campaign! These bags are simple yet elegant. My customers and I love them! Amazed with the quality of these bags! Thanks CEP! I have been a customer of Custom Earth Promos now for 2 years, I have never had a bad experience with them I am always satisfied and they are the best to work with. They always help and share my vision for me and my company's marketing and promotional needs. I have been in the advertising industry for ten years and have not seen a more affordable way to get as many views on our brand logo as I have with reusable bags. We purchased a large quantity for our company as a promotional product last year and today I still see them all over the city, whether it be on trains, at restaurants, parks everywhere. A large part to do with this is custom earth promos, they make a high quality bag that lasts, the printing quality of the graphics is outstanding, and the customer service exceptional. We are in the process of placing another order for some of there other products. These bags are so visually appealing! I also love how they are made of laminate so they are easy to keep clean! These bags were the obvious choice for my company considering they are water and tear resistant. They really do last forever! This is the perfect promotional item for my business! These bags are sleek and easy to carry while still being visually appealing. These bags are ideal! They are the perfect size for people on the go. My clients use them on a daily basis! I ordered my bags thru their website, very easy to use.. And the bags even arrived on time at the time I requested the way I designed it.. Next time I have an event I will be using custom earth promos.. 5 stars!!! I have been in the event and party planning industry for 10 years.. I always suggest for any of my clients who want to make custom bags or other items to go with Custom earth promos.. Always professional and the products are great and affordable..
My wife has used this company before for all her marketing needs, so I decided to give them a shot. Now I too use them for all of my company's promotional needs, especially the recycled bags. The quality is great and you can't beat the price. I own a small farmer's market and promote green living. I have used recycled reusable bags before but through another manufacturer. I recently switched to Custom earth promos for all of my recycled reusable bags for my farmers market. CEP's bag handles are double stitched on both sides of the bag which makes the bags ten times more strong to carry groceries. The other manufacturer the biggest complaint was the handles falling apart from the bag, due to poor stitching. This only is a reason for going with CEP, there craftsmanship is the best i've seen when it comes to recycled reusable bags. I use this tote bag every time I go to the gym. Hasn't failed me yet! I work in marketing for a sustainable building materials company and we use Custom Earth Promos for all of our promotional needs. I just placed our 6th recycled bag order with them for a upcoming event. Every time there products are a success but nothing gets as much use as there bags, I still use the one from our very first order with them! Recently had an event to support breast cancer awareness and used Custom earth promo bags. It was a great success and raised tons of money! I use this bag for my pet and all of her needs when we travel. It's very durable and I am able to clean if it gets dirty. Highly recommend for any pet owners. Fabulous bags! I completely customized and personalized my order exactly the way I wanted! I love this website! So easy to use and place an order! I uploaded my company's logo to be printed on the front and back of the bag and then provided my delivery date and boom was given a price and placed the order. Now if everything at work can be this easy lol! They printed my organization's logo on the front, back and even sides of the bag, the logo was crisp and pristine. I have been in marketing for many years now and am well versed in the recycled products industry including reusable bags. Custom Earth Promos Bags are probably the best I have seen. The quality that there bags are fabricated is not seen in their competitors versions. They double stitch the handles for reinforcing strength. The graphic design department at there company is a pleasure to work with and they have always delivered the product in the delivery date provided. I highly recommend them for any promotional/ marketing product. Me and my partner just started a "green" nonprofit company and thought this would be a good idea to promote the company to hand out recyclable reusable bags stuffed with company information and small gifts at our launch party event. Man where we right! We have gotten more calls into the company from folks saying we saw your bag at the store or wherever and we are interested in your business. I got to thank custom earth promos for this. Y'all are some good people with a good product. Looking forward to the next order! Looking for an eco-friendly, cost effective product to create brand awareness with maximum impact with minimal effort? Measuring 8” x 10”, our Mini Recycled Reusable Grocery Bags are the answer. 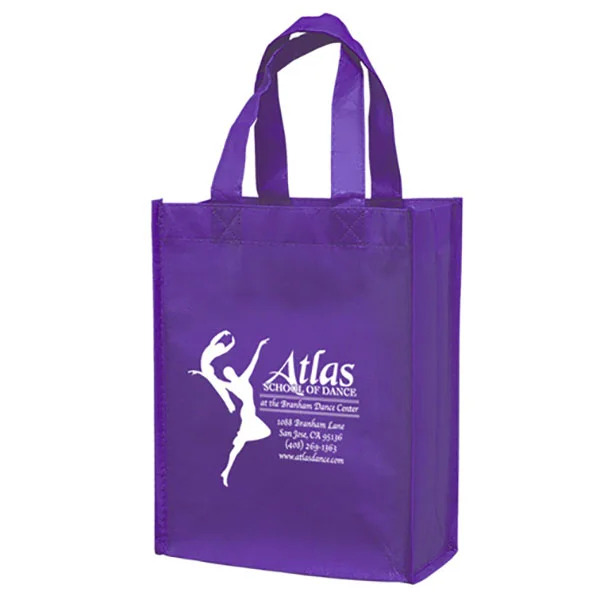 They’re a great way to distribute free goodies to your customers and let them carry it all around with ease. And these bags are perfect for carrying everything from lunch to groceries, plus they make ideal gift bags for any occasion. Built to stand the test of time, these bags (and their sturdy handles) are made with laminated PET material, which is durable and stylish. 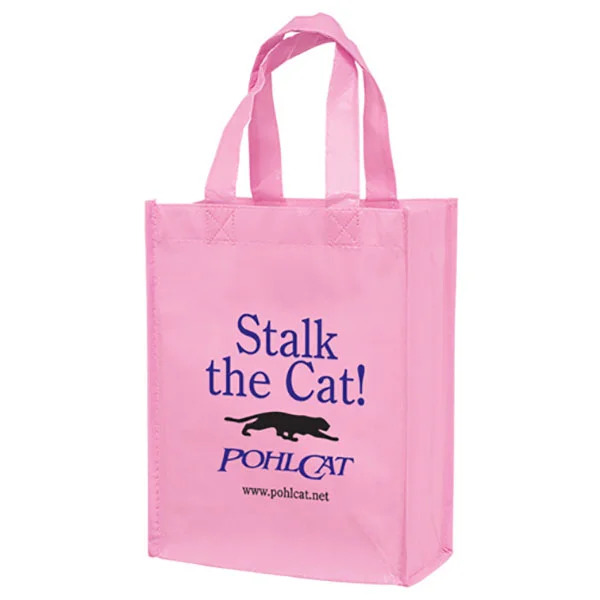 Their small size and light weight make these totes perfect for carrying a wide range of items. So your environmentally-conscious customers will love using them everywhere, all the time. Small. Durable. Practical. Functional. Cost-effective. These are just a few of the qualities that set Custom Earth Promos' Mini Recycled Reusable Grocery Bags apart from the rest. Designed with a light gloss finish, these bags are both stylish and functional, so your customers will love carrying them on every shopping trip, and who knows where else? 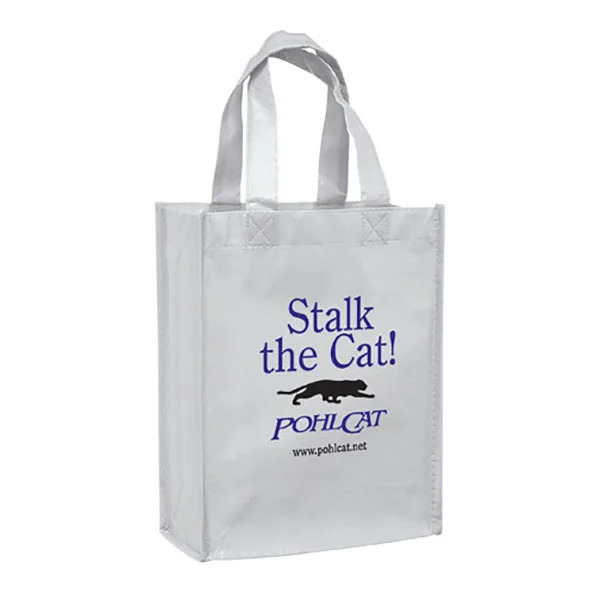 Made from a strong non-woven, gloss-laminated 110 GSM PET that is easy to wipe clean while providing added structural strength, these mini-totes are small, handy and very easy to use. They’re also designed to resist water, tears and UV rays. And because they’re produced with recycled materials, using these bags is a truly practical way to promote the green message. Built to stand the test of time, these bags—including their sturdy handles—are made with laminated PET material, which is durable and stylish. Their small size and light weight make these totes perfect for carrying a wide range of items. So your environmentally-conscious customers will love using them everywhere, all the time. 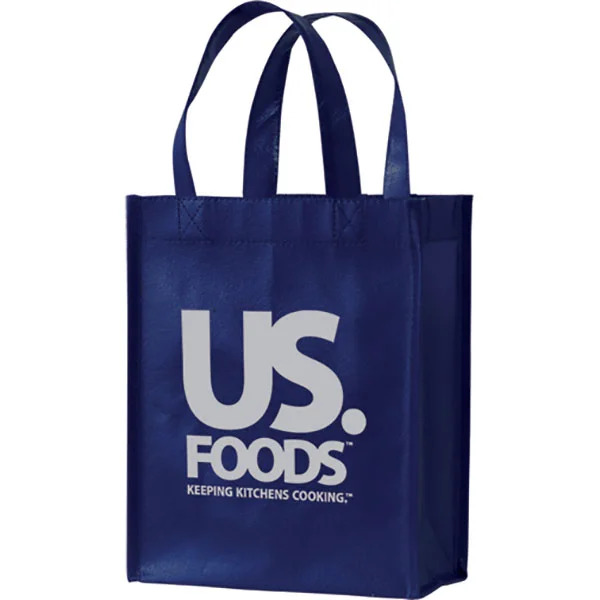 What's more, our innovative designs and competitive prices make the Mini Recycled Reusable Grocery Bag an invaluable and cost-effective addition to your next marketing campaign. We even offer exciting discounts on bulk orders, ensuring that each bag is woven and printed to perfection. When you choose Custom Earth Promos, you can rely on the quality, durability and style of all the products you use in your trade show marketing campaign. 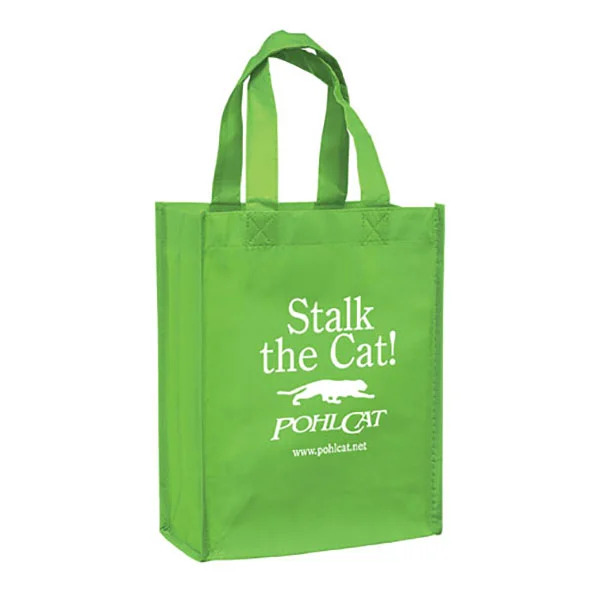 That includes our recycled mini totes, the perfect product to generate brand recognition and impress the public with your eco-friendly initiative. With our Mini Recycled Reusable Grocery Bags, you have plenty of options when it comes to customization. Available in three simple, elegant, eye-catching combinations, we can print your logo on the material surface, creating clean yet visually appealing patterns. And we use screen printing to imprint your brand logo on the mini totes, making these eco-friendly bags an exceptionally effective marketing tool. You can imprint a variety of graphics on the tote bags, whether it's your company logo, a small design or even a short personalized message for your customers. 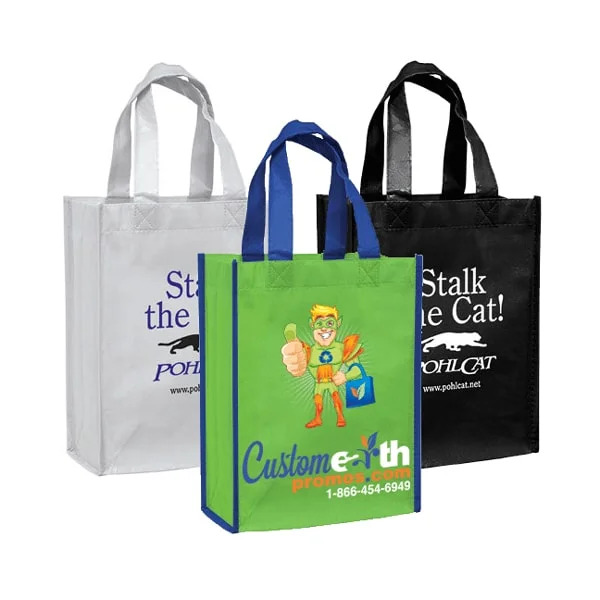 With years of experience in the environmental packaging industry, we offer professional and well-crafted tote bags for any occasion. Exploring different options in design, size, color or cut? We can make it happen. And with our competitive prices industry-leading service, marketing your brand just became that much easier!